Q: How did you get the idea to start BUKO? A: I got the idea to start BUKO while I was procrastinating for finals in the stacks of Olin. I was browsing a random tech blog and I saw that the Raspberry Pi was being used in Cameroon to teach young women basic computer literacy. 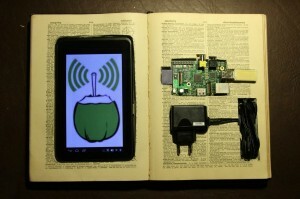 At the time, the idea of using the device as a server hadn’t yet become popular. I had learned of the Pi and its capabilities a couple months before, and was impressed by the efforts of those in Cameroon. I thought that by adding little improvements to their deployment, I could make a Pi deployment even more successful back home in the Philippines. I showed it to my friend Adam Forbes ’12, a senior comp sci major at the time. He told me that I wasn’t crazy, and that he thought that it could work. I then contacted two friends from high school who I thought would be interested in setting up something like this with me—Alonzo Virata and Blanca Villanueva. Both of them also happened to go to Stanford, where I knew startup culture and tech related projects were very common. We began collaborating that summer. Q: What is the significance of BUKO, the acronym for your program? A: “Buko” is the Filipino word for “coconut.” The coconut is a resource rich natural wonder that many cultures have used in a variety of different ways. In my country, the coconut is so abundant that it has become somewhat of a cultural icon. We built our server with the intention that it be just as adaptable in its potential uses as the coconut. Q: How were you able to gain access to the e-books, video lectures and other educational tools you make available? A: All the content on our server right now is offered for free on the Internet. None of the content is actually ours (but we’re hoping to change that this summer). We simply make what is available for free online, offline to those who need it most. Q: Please tell us about the initial deployment of BUKO in two metro Manila high schools in 2013. A: We got off to a rocky start, but the deployments are running very smoothly at present. Initially, the teachers were reluctant to accept a device that they feared would eventually replace them. Slowly, we held workshops demonstrating how they might integrate the content into their lectures, and how it would save them time in the long run. So far, so good. I was present for the initial deployment, but I did not do this alone. I’ve had a large amount of help in following up on our two deployments from the Corporate Social Responsibility arm of 7-Eleven convenience stores in the Philippines. The first stage in our process was the identification of the schools; in our case, we chose the honors classes of already high-performing high schools as we thought this would minimize the learning curve associated with students getting used to the devices. The second stage consisted of contacting the school and receiving the approval of the headmistress. The third stage was a presentation to the teachers at large on the opportunity to use, and the effectiveness of our server and devices. Q: What has been the response from students and teachers? A: The students love using our servers and tablets, no doubt. For the first couple of months we were having problems because the students would fill up the memory with selfies and messages to other classmates. The teachers have begun to love it too. They realize that some lessons are better taught with a video, and that sometimes students may benefit from reading an article on Wikipedia before the actual lecture. They’ve said that their lessons have become more dynamic and engaging (and easier to prepare) than before. Q: How will you use the seed grant from the Patricelli Center for Social Entrepreneurship to expand this project? A: With the money from the SEED grant, we hope to do many things. This summer will be a summer of huge progress for BUKO, if we do it right. We hope to create our own content, tailored specifically to students in Philippine public schools. This will include (but is not limited to) tutorial videos on Philippine history and language, as well as exam guides to the major public universities. 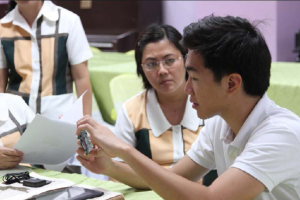 With the remaining funds we hope to deploy our server to the remaining high-performing high schools in Manila. We are now operating with the support of the Department of Education, and they have chosen our next four deployments. Q: What are your long-term goals for BUKO? A: I hope to have a server in all the Philippine public classrooms currently under resource strain, so that I might have a hand in the education of a more capable and empowered generation of Filipinos. If anyone wishes to deploy my server in other countries, I would not object to that one bit. Anyone interested in the project can contact me at jbenares@wesleyan.edu. I look forward to working with you! Q: Please tell us about your studies and other activities at Wesleyan. 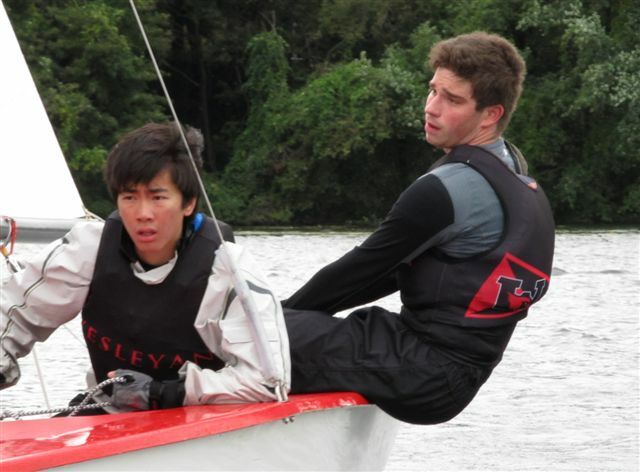 At left, Joaquin Benares is a member of the Wesleyan Sailing Team. A: I’m a government major, in true liberal arts fashion. I’m a member of the Wesleyan Sailing Team, a brother of Psi Upsilon, and a member of Pinoy – the Filipino Cultural Club. Q: What has been your favorite part of your experience at Wesleyan? A: The novelty of independence was definitely the greatest part of my Wesleyan experience. The adventure of starting a portion of my life on the other side of the world shaped every amazing Wesleyan experience I’ve had. Q: What do you plan to do after graduating? A: Ideally I’d like to work somewhere in New York doing something technology related, or anything that will introduce me to new ideas every day. Maybe consulting? I wouldn’t mind going back home to work on BUKO full-time to be honest, but let’s see how this summer goes first. At some point, I just want to bring what I’ve learned back home to help move my country forward. Read about other Patricelli Center seed grant award winners here.